Here are the best routers for streamers and gamers alike, the perfect investment for strong internet whether you live in an apartment or large house! If your router has gotten too slow for gaming or streaming, it's a good idea to invest in an upgrade. A new wireless router can be a tricky purchase, because there is a lot of technical jargon involved. At the most basic level, you'll want to look for specs that offer the greatest Wi-Fi circumstances whether you live in a big house or a small apartment. It's also worth discovering which router will be best for your budget. We'll help you to find the router that will be best for your needs. In addition, we'll be taking a look into the specs, we have put together a list of routers that will be best for the most common situations customers’ experience. For those people who aren't keen on the technobabble, we'll make sure information is easy to understand. A whole new Wi-Fi setup can offer you superb coverage almost anywhere in your house. Furthermore, adding in a Mesh Wi-Fi network is an even better addition to your internet needs. The product reviews below will help you with picking the perfect router for your needs. If you live in a household that has a higher level of Wi-Fi traffic, then you're going to need a router that measures up. 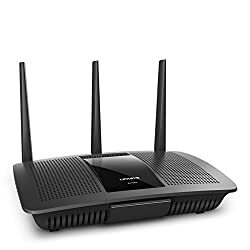 The Linksys Ac1900 Dual Band Wireless Router is an excellent device capable of offering a strong Wi-Fi connection. Even if you live in a multi-story home, this router creates faster speeds and a blanket signal to ensure everyone can stay connected with ease. When it comes to great devices, the Linksys AC1900 is top notch. You'll easily be able to connect it to your game consoles, smartphones, smart TVs, tablets and even virtual assistants. Because of this feature, you'll be able to talk to Alexa in no time using this router's Beamforming Technology. Setting up this device is simple. Make sure the Linksys AC1900 is located in the center of your home, that way you won't have any difficulty getting a strong signal. Then, just use the Linksys' Smart Setup Wizard to get the router going. As a result, you'll no doubt be hitting 1300 MBPS speeds on your 5GHz band in no time at all. If you live in a large home, it's especially important to have a stronger connection for everyone. Luckily, the Linksys AC1900 can direct its signal towards every remote corner of your household. With four gigabit Ethernet ports and Multi-User MIMO Technology, it can handle multiple bands, including the 5GHz band as well as a 2.4GHz band that allows for speeds up to 600Mbps. 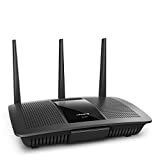 The mobile app included with this router also helps you with controlling your home networks as well as your router, and maintain your free smart Wi-Fi account. Offering USB 2.0 and 3.0 ports allows you to connect in multiple ways. Furthermore, you'll get fast Ethernet speeds in no time at all, allowing you the ideal connection for gaming and streaming. You'll even be able to stream simultaneously with others in your home. For gamers and Amazon reviewers alike, the ability to transfer data 10x faster than other options has made this router a favorite. There can be some difficulties with getting this router setup and keeping a strong signal. Allows you to connect plenty of devices. Some customers have trouble getting it to connect. In some cases the signal isn’t as reliable as customers want. If you're looking for a router with a lot of range, then the AC1900 is an excellent option. 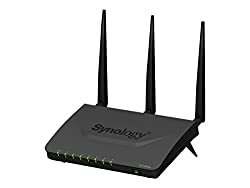 When you need something that is able to handle wired and wireless connections simultaneously, this router is an excellent option. The TP-Link Archer C9 AC1900 comes with a strong 1GHz dual-core processor that allows you all the speed you need without any lag. Due to the 1.9Gbps of total available bandwidth, this device will let you enjoy internet surfing, gaming and more without interruptions. The AC1900 is able to create a powerful Wi-Fi signal and spread it across the house. Consequently, you'll be able to stream from just about anywhere, including your couch, bed or even backyard. Due to its high-powered amplifiers and three dual band antennas, you'll be able to stream Netflix with ease anywhere around your home. If you're a fan of Apple products, then you'll surely enjoy the curvy white design of the AC1900 that makes it much more aesthetically pleasing than typical black routers. 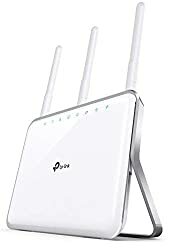 Setup for this device is also a cinch, all you have to do is get plugged in, enter your admin password, followed by your Wi-Fi name/password into the Tp-Link website and you'll be ready to go! There's an easy to find Ethernet connection socket on the AC1900 that allows you to connect to your modem. The device also offers a 3.0 USB port, USB 2.0 port as well as four more gigabit Ethernet ports to help you with connecting all of your devices. Due to the 802.11ac support, you'll be able to reach streaming speeds up to 1,300Mbps on the 5GHz band and 600Mbps on the 2.4GHz band. There can sometimes be difficulty with the range on this device. In some cases, customers find that the signal strength drops too quickly within only small distances. Customers can sometimes have trouble getting the antenna to work as intended. In some cases, the signal can waiver. If you're looking for something that can offer a lot of streaming power, the Tp-Link AC1900 is an excellent choice. 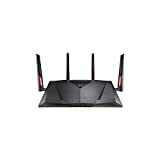 Those with an interest in online gaming understand that a router with a high-bandwidth capability is ideal. The same can also be true for streaming a ball game or networking as part of your business or hobbies. The Asus T-AC88U offers the specs you need for high-volume internet use, whether it's for gaming or cheering against your team's contenders, this hardware has a lot to offer and comes with low-latency needs. You'll also get plenty of ports for connecting your devices. If you're a serious gamer, then the Asus T-AC88U is a machine with a lot to offer you. It offers eight LAN ports to allow you to connect plenty of devices. In addition to a 512MB memory and 1.4GHz dual-core processor, you'll get a lot of power and a coverage area of up to 5,000 square feet. Consequently, the Asus T-AC88U a great choice for the avid gamer. You'll have no problem getting a strong connection to all of your gaming devices using the eight Gigabit Ethernet ports on the Asus T-AC88U. Also, it has a lot of power for local co-op activities and even server-hosting for those who like to run their own games. On top of that, the transfer rates and overall speed offered by this device makes it ideal for gamers. To add even more to your gaming purposes, this router also offers ports that match USB 2.0 and 3.0 standards. With the power and sheer number of devices this machine can handle, it's certainly the better choice for gaming fans. Some customers have complained that this router isn't worth the cost, offering a spotty signal and sometimes ceasing to work altogether. In some cases it can suddenly stop working. If you need something that can offer a strong signal for your intense gaming sessions, then this is an excellent option for you. If your favorite shows never seem to stop buffering, a new Wi-Fi router may be in order. The NETGEAR AC1750 is the best choice when it comes to streaming the latest episodes of Game of Thrones. In addition, this Smart Wi-Fi Router uses high-power external antennas to offer speeds of 450 + 1300Mbps. The NETGEAR AC1750 is an excellent device for streaming, gaming and more with the improved coverage it offers. You'll also get the very best wireless security through the use of WPA/WPA2. In addition, the proprietary Beamforming + technology makes the NETGEAR AC1750 a force to be reckoned with. In order to better understand Beamforming technology, it helps to think of it in terms of a radio transmission signal that travels from the transmitter to a receiver. You can also adjust the signal on the NETGEAR AC1750 based on the locations of both Wi-Fi devices. You can also set up a separate route for secure guest network access that's perfect for when you have company. If you're looking for stronger Wi-Fi signals, the NETGEAR AC1750 is an excellent wireless router choice. You'll get a more stable connection with reduced dead zones so you can stream without interruptions. Due to the NETGEAR genie app, you'll be able to manage and monitor your home network remotely. Parental controls and web filtering will also be easy to use. When you need a device that offers extended Wi-Fi coverage and better throughput to your connected devices, the NETGEAR AC1750 is a great option. For access to great voice and HD video for the avid streamer, as well as both USB 2.0 and 3.0 ports there are few better choices out there. When it comes to fantastic devices, the NETGEAR AC1750 is a powerhouse! Make sure to be aware of what the warranty covers before purchasing this router, because in some cases it has ceased to work after being used for just a short while. Offers a huge signal range. Handles high internet traffic easily. Signal can drop without explanation. If you're looking for something with a lot of streaming power, this router is top notch. If you live in a small apartment and need a strong connection, the ASUS RT-ACRH13 is the perfect solution. It may not offer the kind of range that can cover the huge amount of space a big house can have, but it's great for smaller spaces and makes for a hip home accessory. While it isn't a big router, it is a great device that offers good range for your apartment. 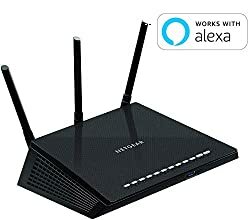 This router offers combined speeds of up to 1267Mbps, which is more than enough for you to be able to connect multiple devices such as your computer, smartphones and more. Because of the Asus Router App, you'll also be able to monitor and manage your home network from your Android or iOS phones. Furthermore, the power offered by the four external 5dBi antennas make the RT-ACRH13 one of the best routers available. The RT-ACRH13 is able to offer a lot of power to handle your uploads or downloads with ease. For the price this router comes at, it has a lot to offer and will surely become a reliable tool in your household. Want to take a look at some other options? See our guide to the best ASUS routers. Make sure to keep an eye on your signal and update or reboot as needed, because some customers have begun to experience disconnects with no apparent cause. Speeds are reliable and fast. Some customers can experience random disconnects. This router is more expensive than other options. If you need something to offer a great signal in a smaller space, then this is a fantastic choice. 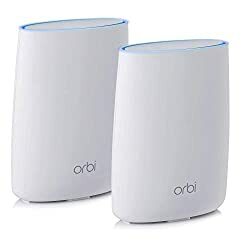 For homeowners who need a solid Wi-Fi signal that can reach every point in their house, Netgear's Orbi is a fantastic option. The devices that come the Orbi work in combination to offer you solid performance. This router in addition to an identical satellite device work to extend your Wi-Fi signal throughout your home. To make this router even more convenient, it can be set up in under five minutes. Just get this device placed in a central spot to cover Orbi's ideal range and plug it into your internet modem. 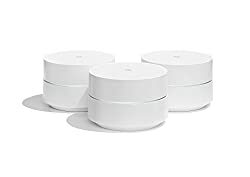 The device pair is designed to work well in a 4,000-square-foot home, but if your home is much larger then you may want to consider purchasing an extra satellite device to extend your connection signal another 2,000 feet. Whether you have a home with a lot of space or just a device-heavy household, the Netgear Orbi can offer the perfect solution. It has a USB 2.0 port as well as three Ethernet ports that give you an easy way to connect your wired devices. The Orbi unit also supports 802.11ac for up to three Gbps. Due to the 2.4GHz and 5GHz radio connections, you'll have all the power you need. Due to its design, the Orbi satellite can sit near your modem without being an eyesore. This makes it easier to place as many of these Netgear devices around your home as you need. With the expected range on this device, you won't need to add too much extra hardware unless needed. Your entire house will have a great connection that works perfectly with your home ISP. Customers who require technical support relatively often don't enjoy that after a few weeks the support service requires added payments to stay in place. Offers a large signal range. You may have to pay for support service. There can sometimes be problems with the firmware causing disconnects. If you live in a large home and need something that can reach every corner, then the NETGEAR Orbi is a great option. If you need a router than can handle multiple high-bandwidth applications and comes at a price less than $50, then the TP-Link AC1200 may suit your needs. With the Signal Sustain Technology (SST), this budget router ensures a stronger Wi-Fi signal than other options. With 867Mbps at 5GHz (and 300Mbps at 2.4GHz) in comparison to the original Archer C7's1.75Gbps (1750Mbps) of throughput, this router may have less power, but it won't let you down! If you use your internet for work, then the TP-Link C1200 can help you to avoid clogging the Wi-Fi. Due to the IP-based Bandwidth Control, you can limit individual users so that they aren't taking up space. You'll be able to check your email and handle business needs while users streaming Netflix or using other intensive applications are more limited. Because of the 802.11ac Wi-Fi technology, the TL-WR1043ND is the perfect device for browsing your memes, web surfing or playing games without the internet slowing to a crawl due to a fault in the router. With one USB (2.0) port and four Gigabit Ethernet ports, you can connect plenty of devices. This device is essentially a lighter version of the Archer C7. With its detachable antennas and decent speeds, the TL-WR1043ND may be more limited than the Archer C7 but it also costs around $49, helping those with a budget. It comes in a boring package but has a lot to offer, including a two-year warranty. For a router in the sub-$50 price range, this system is truly future-proofed. Overall, if you're looking for something like the Archer C7 but at a lower cost, this is it. Check out our other reviews of the best routers under $50 available on the market today. 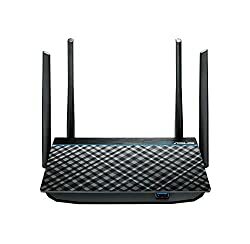 Customers claim that this router works very well when it is connected, but it loses connection frequently. Can help with increasing the speed of your internet. The signal can sometimes waiver. It can stop allowing devices to connect. If you're looking to get a great signal and stick to a budget then this router is a fantastic option. When you need to cover a lot of space, Google's Wi-Fi system is a great option. It comes with three satellites that function as Wi-Fi points to keep your signal strong all over the house. A single point can fill up to 1,500 square feet, so three points can offer blanketed coverage for up to 4,500 square feet. Unlike a traditional router system, this one contains multiple points that look like white hockey pucks that work to extend your range. With each individual point, you'll get 4 Gigabytes of eMMC flash memory as well as 512MB of RAM. The devices also each support both AC1200 (2x2) 802.11s(mesh) and 802.11ac so that you can get the most out of your Wi-Fi. One small downfall is that you won't be able to designate a device to its own band because the 5GHz and bands are combined into a sole band. On the upside, these Google devices use beam-forming technology, as a result they will route your devices automatically to allow them to get the strongest possible signal. You'll also be able to set up guest networks, test speeds, check the status of your points and see which devices are using the most bandwidth using the accompanying app. Consequently, you can manage your internet from your iOS or Android device. In conclusion, for busy homes that have a lot of devices competing for bandwidth, the Google Wi-Fi System is one of the best options out there. A quad-core Arm CPU is housed by each point, as well as a Bluetooth radio. Some customers do find that the points don't do much to increase their Wi-Fi signal, therefore claiming that this system is oversimplified. Some users can experience Wi-Fi congestion. Some may continue to get a weaker signal even with the system in place. For those who have high amounts of internet traffic and want something that can keep up and reach every corner, this system is an excellent choice. The Synology RT1900ac offers a fast home network that is highly customizable and the perfect choice for those looking for more advanced features. Most notably, this router is capable of creating fast Wi-Fi speeds and offer a robust network storage server for your benefit. Furthermore, it's great for those who want to be fully in control of just about every aspect of their network. If you need something that can offer a long range, the RT1900ac has got you covered. That means you won't have to worry as much about adding on more hardware to extend the signal unless you have an especially large house. Due to a strong broadband connection, you'll easily be able to stream Netflix, browse the web and work with the RT1900ac from just about anywhere in your house. Some customers have had problems with the firmware, but with the right knowledge and support this device has a lot to offer. You'll also be able to back up the router using Apple services that come with this router rather than having to plug in an external hard drive. Furthermore, you'll be able to plug in just about any device you need using the four LAN ports. Finally, the RT1900ac is a fantastic option for those who want control over their internet. It's truly an exceptional device, and well worth a shot. 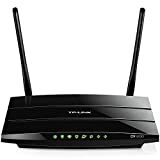 Customers have had problems with losing their connectivity and consequently having to reboot the router relatively frequently. Some customers claim they don’t get enough speed from the router. Software issues can sometimes lock devices off the network. If you have a strong technological understanding and want something for the more advanced user, this router is a wonderful choice. This unassuming device is made with some quality features, though they may not quite be at outer-space levels. As a result, the Linksys N600 brings itself into our list for the dual-band router with the greatest level of simplicity. The machine is sleek and simple, though it may not offer the absurd speeds included in other options. In addition, the N600 is able to provide download and upload speeds at up to about 300Mbps. It also features 5GHz and 2.4GHz bands so that your devices will be able to get stable connectivity. Furthermore, you'll also be able to get transfer speeds that are up to ten times faster through the use of Gigabit Ethernet ports that are onboard the device. Through this alone, you'll be able to get more than the average wired connections that are offered by a lot of other routers. As a result of those additions, you'll be able to get a faster connection to your devices. You'll also have access to an SPI firewall as well as WPA2 and WPA encryption techs, to ensure you get the security you need. In addition, you can use the Linksys Smart Wi-Fi app to control the connectivity and settings on the N600 centrally. That app is also going to be downloadable for a variety of devices including Android and iOS. 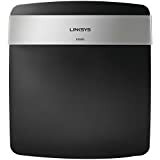 This allows you to avoid the issues that can come with getting to Linksys controls through the browser-based data portals as a result. Consequently, the N600 provides users plenty of additional controls and customization, including parental control, making it a very easy-to-use device. While many can get some solid use from this device, some can find that speeds or full connections can drop if it isn't reset regularly. If you don't need something fancy and just want to get your internet at a decent speed, this is an ideal choice. When you need a strong Ethernet connection, the Linksys AC1900 rests at the top of the list for this article. It offers solid coverage across your entire apartment or house to make sure you have the connection you need as a result. If you aren't sure whether or not that device will meet your needs, then rest assured there are plenty of articles from this list that can get the job done. So whether you need something that fits your budget, has plenty of extra Gigabit Ethernet ports or wider range options to cover more space you'll surely find what you need from the devices we've listed here.